From egg incubator to brooder: when to move chicks. How to move a chick from one to the other safely. 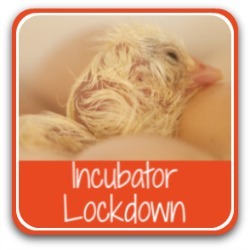 So incubation's finished, your chicks have hatched and now they need to go from egg incubator to brooder - but how? And when? How long can they stay in there? When is it safe to move them? What about the other eggs? When is it OK to open the incubator lid? Will they get cold if they're not moved straight away? Will they get cold if they are? So many questions ... And here are some of the answers for you. Sandro, one of my Polish chickens still in the incubator, two hours post-hatch. 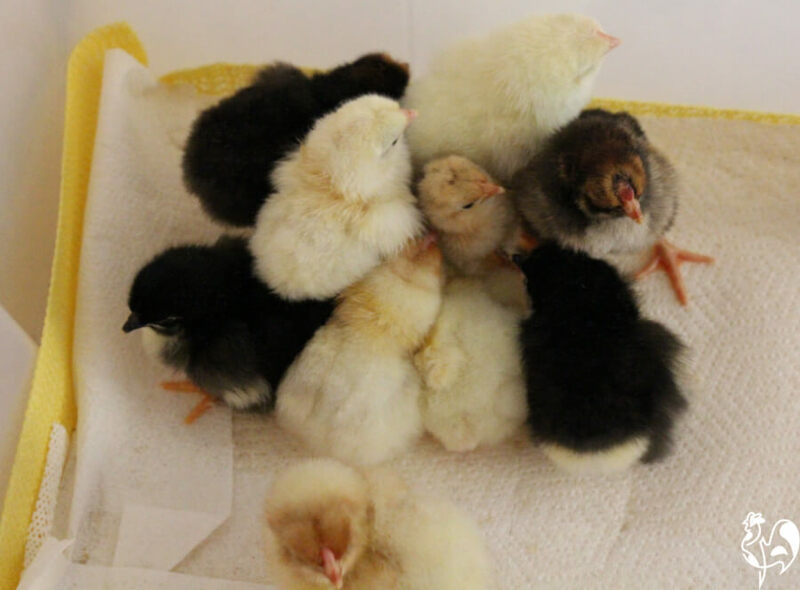 How long should newly-hatched chicks stay in the incubator? Chicks come out of the egg very wet and should not be moved from the warmth of the incubator until they are properly fluffed up. Moving them before that can chill them, and chicks can die very easily if they become chilled. But there's no hard and fast rule about when this should be, because chicks will progress at different speeds. Some will fluff up within an hour, others will take longer - it partly depends how many chicks are hatching at the same time. Keep an eye on your chicks. Make sure they're beginning to dry out within an hour or so of hatching. 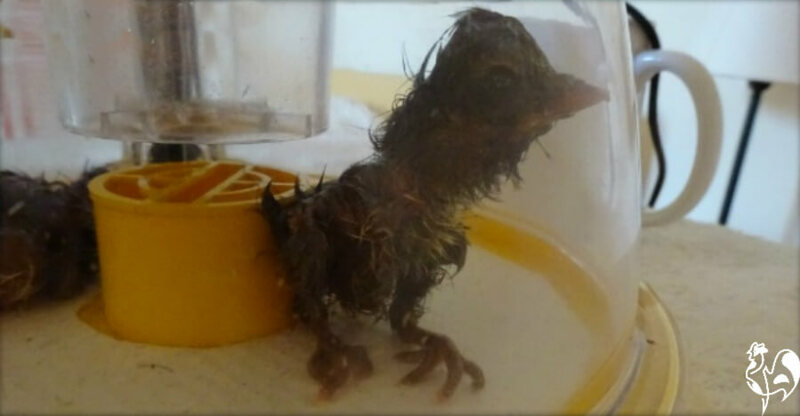 The same Polish/Poland chicken as in the pic above, immediately post hatch, before she dried out. When is it safe to open the lid of the egg incubator to move the chicks? It's safe to do this if you are absolutely sure that no other chicks have 'pipped' (started to make a crack in the egg shell). 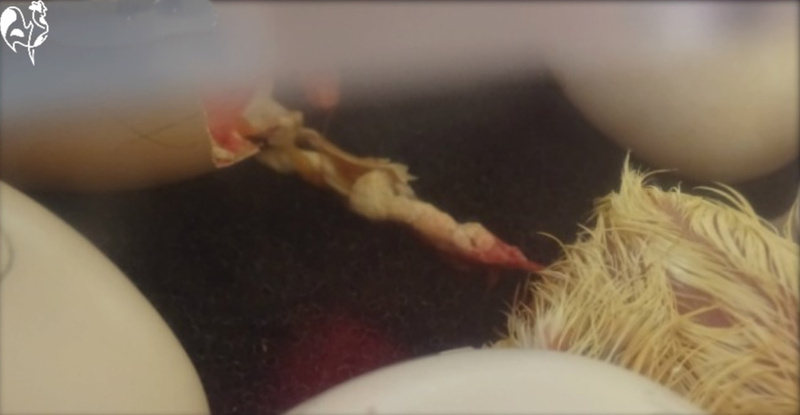 Even if the pip is tiny, opening the incubator at that point will cause humidity to drop immediately which can dry out the membrane of any chicks who have begun to pip. A dried out membrane means the chick is unlikely to be able to hatch itself. The membrane becomes very 'leathery' and hard rather than pliable and the chick won't be able to break through it. At best this means you will have to assist it in hatching. At worst it will mean that the chick will die in the egg. So resist the temptation to open the incubator too soon. The chicks will be fine in there for several hours. One of my Wyandottes and a Light Sussex chick sleeping it off in the Octagon 20 incubator. But what about the other eggs? When chicks hatch they tend to stumble around the incubator like mini-dinosaurs, not really able yet to keep control of their legs. They will inevitably knock into other eggs which haven't yet even started to hatch and it can be worrying to think that, having left our eggs in peace since lockdown, these little dinos are kicking them around. Don't worry. All will be fine. There is evidence that the eggs being moved by the already hatched chicks, and in particular their peeping, encourages the other chicks to start pipping. What about chicks who look as though they've suddenly dropped dead? Pipping, unzipping and hatching takes an enormous amount of energy out of the chick and their need for rest immediately post-hatch is strong. One minute they'll be stumbling round and the next, they will suddenly drop. If you've never seen that happen before it can be scary, because it looks as though the chick has suddenly dropped dead. In fact, it's just sleeping. Leave it in peace. It will be fine. Not dead, just sleeping off the stresses of hatch - one of my Light Sussexes immediately after hatching. Chicks are fine without either for up to 72 hours - that's how hatcheries are able to ship day old chicks. The yolk, which is absorbed in the last hours of incubation, will nourish the chick for all that time. However, I usually take chicks out once they are properly dried as long as there are no other eggs pipping. If there are, I leave them alone until no other pips can be seen and then open the incubator lid for as short a time as possible while I take the fluffed-up chick(s) out. 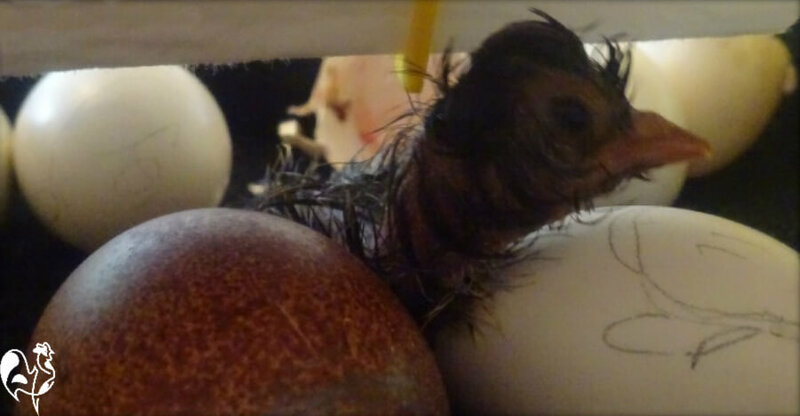 Most chicks will be dry within a few hours of hatch unless others are hatching, when it may take longer because the humidity in the egg incubator will rise. What about a chick who can't seem to get dry? 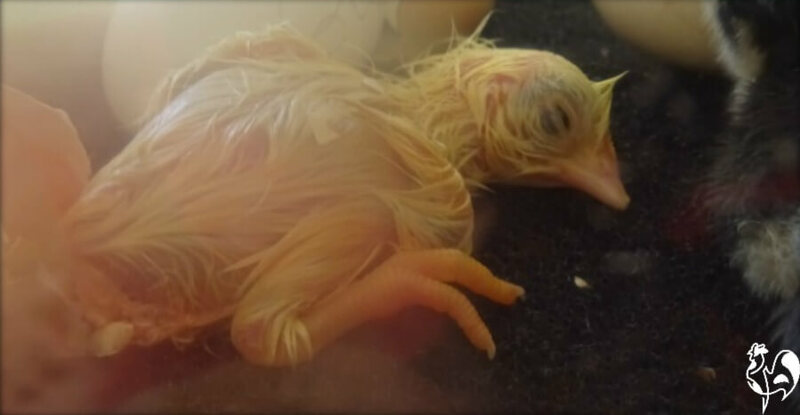 Sometimes, if other chicks are hatching, the humidity in the incubator shoots up and chicks who have already hatched find it difficult to dry off. There's then a balancing act to assess : leave the chick where it is and risk it becoming chilled and dying, or open the incubator to remove it and risk the other chicks who haven't yet hatched becoming 'shrink wrapped' in their membrane? This really has to be dealt with according to each individual situation. I generally go for opening the incubator very quickly, removing the chick and adding some kitchen paper soaked in warm water into the incubator. This raises the humidity level very quickly again and minimum damage is done to the unhatched chicks. But, it's your call. You need to make the assessment for yourself. Once I've removed a chick I place it in my little Mini Advance incubator which I always have standing by for just such cases. This allows them to dry properly and become fluffed up before I put them into the brooder box. This chick wasn't drying properly and needed some 'me time' in the less humid incubator. This also applies to chicks who have had a hard time hatching and aren't looking as robust as the others. Leaving them in the hatching incubator can risk them being pecked or trampled by their more robust friends. These chicks I generally move to my small incubator once it's safe to do so. There's a chick with gunk coming out of it. Do I need to take it out and clean it off? No. Sometimes chicks will still have bits of shell, membrane or the umbilical cord still attached post hatch and you may even see a chick unable to stand, dragging its shell behind it. That's how this Light Sussex was. Still attached to the shell for about an hour after hatching, once it dried out the cord came off by itself. So, leave it be. Don't be tempted to cut anything - you may rupture a blood vessel and once the chick begins to dry so will the 'gunk' which will then fall off of its own accord. There's no need to do anything - and opening the incubator unnecessarily may compromise your other chicks.. So the chick is fluffed up and there is no more pipping going on. Now what? You need to have a brooder box ready, placed somewhere warm but not too hot where it can't be disturbed by pets, children or general passing traffic. The heat source, whatever it is, needs to have been warmed up and you should have water and food at the ready. Take the chicks from the incubator and transfer them into the brooder. Should the humidity level in your incubator fall and you have more eggs to hatch, a quick way to raise it is to put a scrunched up paper towel soaked in warm (not cold) water inside. How much food and water do they need? As soon as you put the chick into the brooder box, immediately dip their beak into the water source. I use The Chicken Fountain's brooder bottle caps, so my water source is always available and always clean. 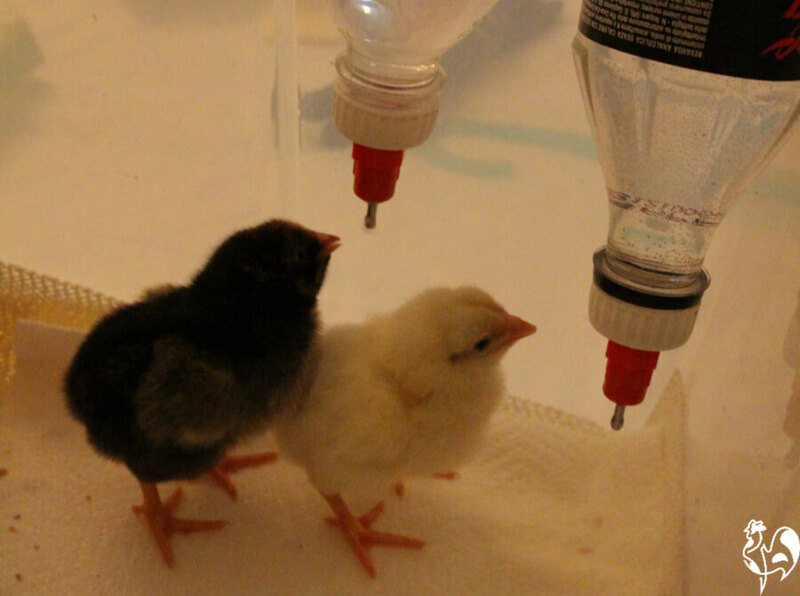 The chicks learn how to use it very quickly and I have no worries about them falling into water pots. If you have water pots, make sure they have some marbles or clean stones in them to prevent the chicks from drowning. Chicks will fall into a pot very easily and it doesn't take much depth of water to drown them. In terms of food, sprinkle some chick starter feed on the floor of your brooder. I use paper towels for the first few days because it's clear where their food is and the sound of the feed dropping encourages them to start pecking. Works every time. And then, leave them to it! 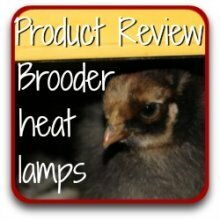 The first hours in the brooder will be quite scary for your chicks. They've just spent three weeks in a nice comfortable egg, then hatched into a strange space and now been moved to another strange place. You'll find that they need time to adjust, and a lot of that time will be spent asleep. Don't worry about it - it's perfectly normal. Just keep an eye on them to make sure no-one is becoming chilled. Now we're at the start of the chicks' first week in the brooder. Chicks huddle together for comfort when first in the brooder. 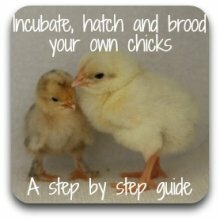 If you're in the process of hatching chicks, you may find these pages useful. Just click on the pics to go to that page.